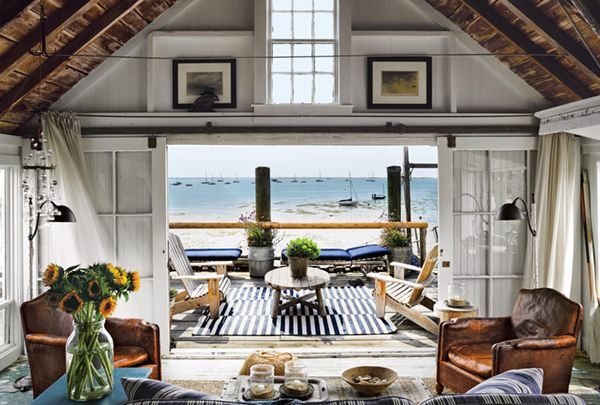 This romantic seaside cottage is a vacation cabin at Captain Jack's Wharf in Provincetown, Massachusetts. 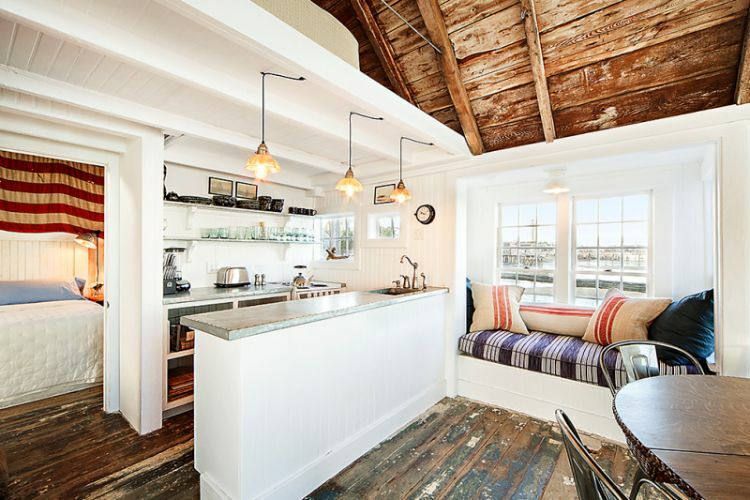 The historic fishing wharf has been transformed into a dreamy destination containing 15 condominium cabins available for rent during the Summer season. This particular cabin is named the Spindrift Hesperus and consists of a two-story great room, a sleeping loft, and a bedroom. 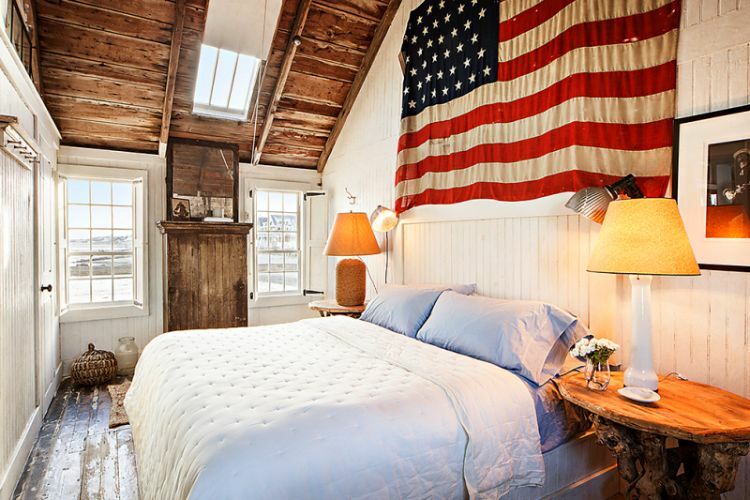 The home was fully renovated in 2011 and each design detail is nautical perfection. 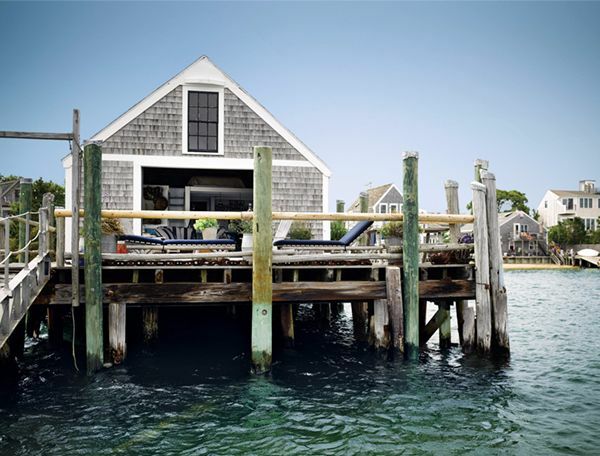 Take the full tour below - can't you just hear the waves lapping against the pier? Enter this cozy cabin with an open floor plan including the living room, kitchen, dining space, and loft bed area. It's full of rich layers of textures and finishes like exposed wood, worn-in leather, and natural textiles. The gorgeous views of this space are something to behold. The living room has windows on three sides and huge glass sliding doors that open onto the deck. Thanks to the vaulted, exposed-wood ceilings and the abundant windows, you don't even notice the cabin's small size. 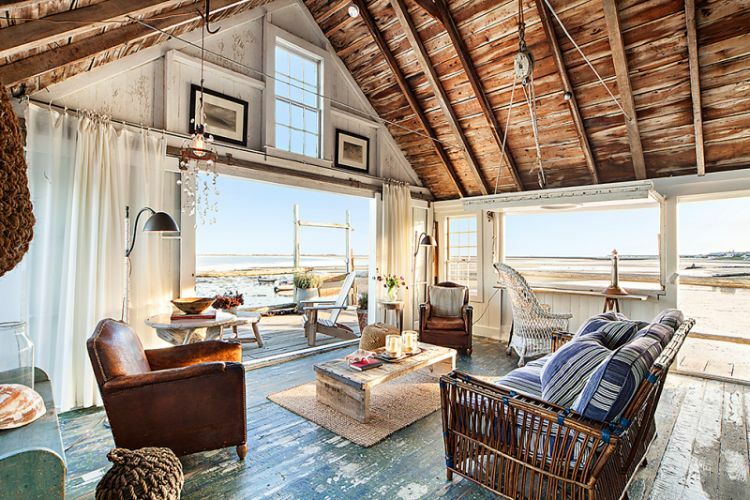 Instead, it feels open and airy with plenty of seating to relax and enjoy the ocean breeze. 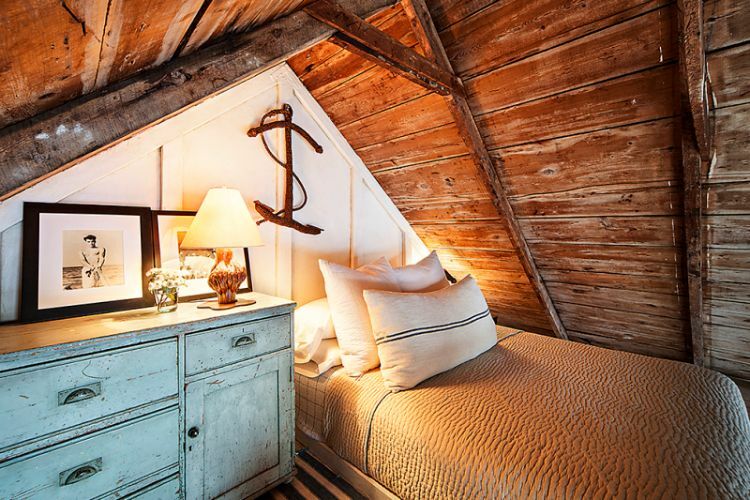 The sleeping loft is secluded and cozy. The details in the decor are just right - a shabby chic dresser is paired with vintage black and white artwork. 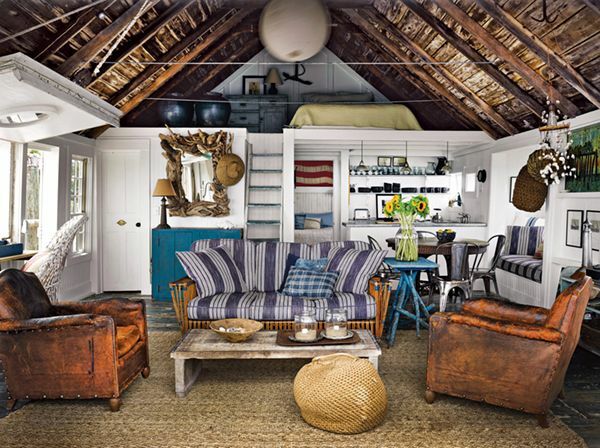 An appropriate antique anchor on the wall finishes the space. The bright white kitchen is tucked in the corner of the cabin. Open shelving displays matching glassware and dishes. Stainless steel counter tops are sturdy and chic. Built-in banquette seating provides the perfect spot to enjoy a cup of coffee in the morning while breakfast is cooking. 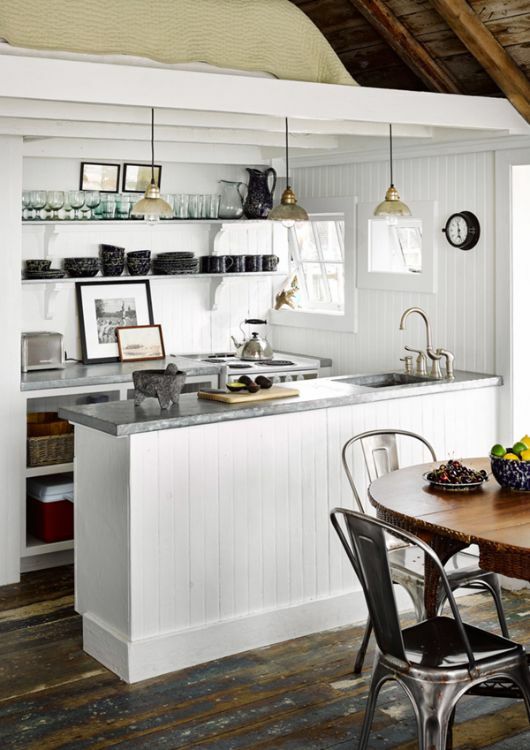 Three nautical-style light pendants hang over the kitchen peninsula.